What do you see when you look into the mind of a genius? Known as one of the world’s most inventive and most sought-after architects, named to Time’s list of the World’s 100 Most Influential People and called “one of architecture’s biggest stars” by the Wall Street Journal, Danish architect Bjarke Ingels is a creative and influential force in modern building design. 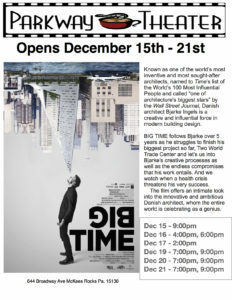 BIG TIME follows Bjarke over 5 years as he struggles to finish his biggest project so far, Two World Trade Center and let’s us into Bjarke’s creative processes as well as the endless compromises that his work entails. And we watch when a health crisis threatens his very success. In addition to 2WTC, Bjarke Ingels’ company Bjarke Ingels Group (BIG) designed New York’s VIA 57 West apartments, won a design competition for improving the flood protection of Manhattan after Hurricane Sandy and is currently working on an array of projects, from a bottling factory for San Pellegrino in Italy, to a panda enclosure at a Danish zoo and a Paris metro station. The film offers an intimate look into the innovative and ambitious Danish architect, whom the entire world is celebrating as a genius.